Office 365 licensing, email and web hosting at the cheapest possible prices. After 15 years of providing top quality email and hosting services, things at Databias are changing. We are now a Microsoft Cloud Solutions Provider offering cost-effective hybrid IMAP/POP and 365 Exchange mailboxes with free spam and virus filtering, email branding and blazingly fast vanilla web hosting. 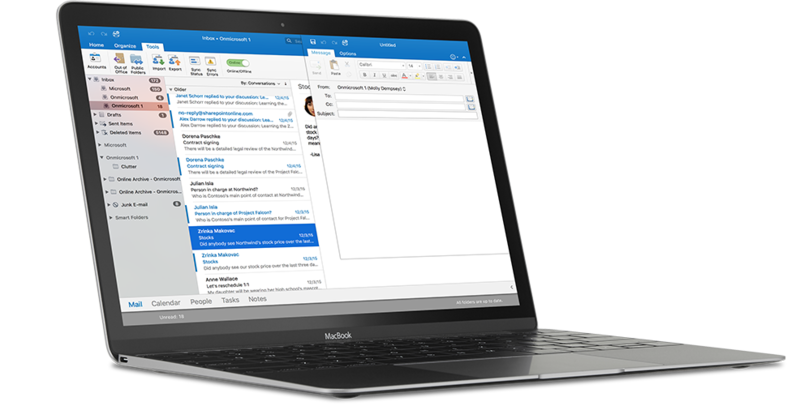 Designed from the ground up for the mobile workforce, Microsoft Exchange puts you in control of your email. 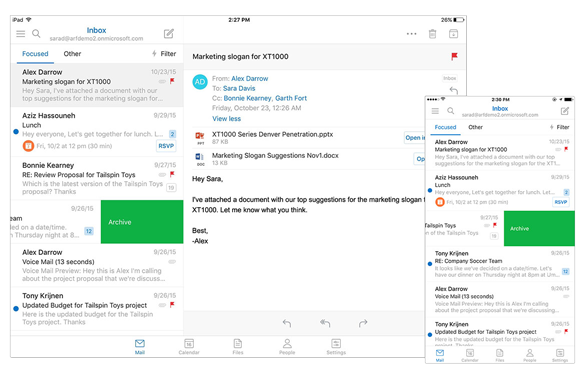 A single mailbox which contains all your mail, contacts, calendar appointments, notes and tasks can be syncronized effortlessly accross multiple devices. It's never been easier to share calendars and contacts with your colleagues as well as documents via OneDrive cloud storage. 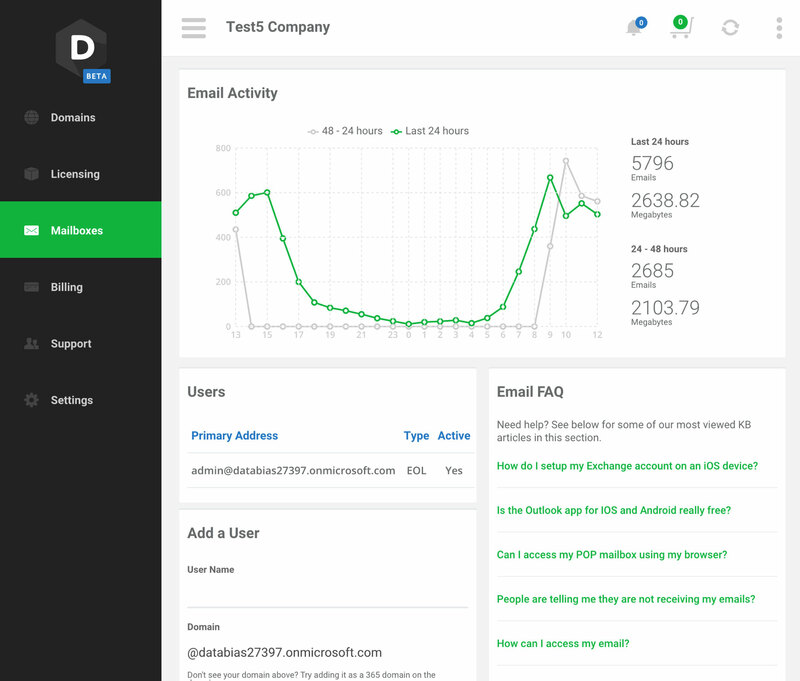 Made for resellers and end-users, our control panel helps you centrally manage all your services yourself and puts you in control of your email, domains and hosting. Easily secure and renew your domains and effortlessly edit your domain zones and subdomains for ultimate control over your IT setup. Add, remove and edit licenses yourself. Our control panel even warns you of possible over-licensing problems, saving you money and effort. With over a decade of experience in blocking malicious attacks, spam and viruses, our multilayer filtering system protects your business. Need all your business emails to appear professional and with standardised signatures? Look, no further; Databias has the solution for you. Capture payment options, view statements and past invoices and configure account preferences in a single, user-friendly interface. Our intuitive self-help support center is only a few clicks away. Still can't solve your problem? Contact our support helpdesk and we'll get right back to you. What makes Databias unique is our fanatic dedication to our customers. Email is ubiquitous today and a proper functioning email system is ultimately important to the daily operations of any business. With Databias as a partner organisation for your email you will never have to worry again about not being in control. Getting a professional email setup is not as difficult as it seems. Choose your applicable scenario below and follow the instructions. Do you already have a 365 subscription of any kind? Do you or your company already have a 365 subscription? In order to get setup we will need to request a reseller relationship from Microsoft for your subscription. This means that Databias will become your reseller of 365 services and all interactions with 365 for licensing and support will go through Databias. Click here to initiate this process. No 365 subscription but you already have a domain name? Already have a domain name that you would like to use with your new 365 mailboxes? We can either transfer and host your domain or you can continue hosting with your current DNS provider. Honestly, we prefer hosting your domain as this makes everyone's lives easier with a centralised solution. Register and then log a support request to initiate the necessary changes. No 365 subscription and you need a new domain? Starting fresh and need a new domain to go with your new 365 mailboxes? Let's see if the domain you want is free and if so proceed with registering you as a new Databias client, securing the domain and then setting up the mailboxes. Enter your prospective new domain below and let's get started with your new setup.